Acquired drug resistance is a constraining factor in clinical treatment of glioblastoma (GBM). However, the mechanisms of chemoresponsive tumors acquire therapeutic resistance remain poorly understood. Here, we aim to investigate whether temozolomide (TMZ) resistance of chemoresponsive GBM was enhanced by long non-coding RNA SBF2 antisense RNA 1 (lncRNA SBF2-AS1) enriched exosomes. LncSBF2-AS1 level in TMZ-resistance or TMZ-sensitive GBM tissues and cells were analyzed by qRT-PCR and FISH assays. 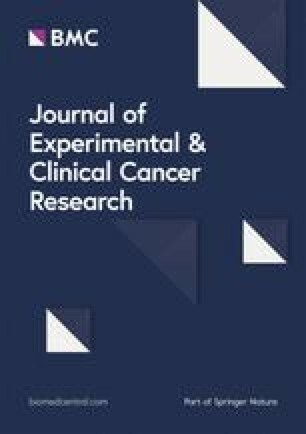 A series of in vitro assay and xenograft tumor models were performed to observe the effect of lncSBF2-AS1 on TMZ-resistance in GBM. CHIP assay were used to investigate the correlation of SBF2-AS1 and transcription factor zinc finger E-box binding homeobox 1 (ZEB1). Dual-luciferase reporter, RNA immunoprecipitation (RIP), immunofluorescence and western blotting were performed to verify the relation between lncSBF2-AS1, miR-151a-3p and XRCC4. Comet assay and immunoblotting were performed to expound the effect of lncSBF2-AS1 on DNA double-stand break (DSB) repair. A series of in vitro assay and intracranial xenografts tumor model were used to determined the function of exosomal lncSBF2-AS1. It was found that SBF2-AS1 was upregulated in TMZ-resistant GBM cells and tissues, and overexpression of SBF2-AS1 led to the promotion of TMZ resistance, whereas its inhibition sensitized resistant GBM cells to TMZ. Transcription factor ZEB1 was found to directly bind to the SBF2-AS1 promoter region to regulate SBF2-AS1 level and affected TMZ resistance in GBM cells. SBF2-AS1 functions as a ceRNA for miR-151a-3p, leading to the disinhibition of its endogenous target, X-ray repair cross complementing 4 (XRCC4), which enhances DSB repair in GBM cells. Exosomes selected from temozolomide-resistant GBM cells had high levels of SBF2-AS1 and spread TMZ resistance to chemoresponsive GBM cells. Clinically, high levels of lncSBF2-AS1 in serum exosomes were associated with poor response to TMZ treatment in GBM patients. We can conclude that GBM cells remodel the tumor microenvironment to promote tumor chemotherapy-resistance by secreting the oncogenic lncSBF2-AS1-enriched exosomes. Thus, exosomal lncSBF2-AS1 in human serum may serve as a possible diagnostic marker for therapy-refractory GBM. Zhuoran Zhang, Jianxing Yin and Chenfei Lu contributed equally to this work. The online version of this article ( https://doi.org/10.1186/s13046-019-1139-6) contains supplementary material, which is available to authorized users. Malignant glioma is the most common primary malignant tumor in the brain as well as being the most lethal in adults. The alkylating drug temozolomide (TMZ) is the international standard chemotherapy for the treatment of glioblastoma multiforme (GBM) . However, resistance to TMZ and subsequent tumor recurrence has become difficult and critical problems in the clinical treatment of GBM. Therefore, exploring the mechanisms underlying acquired TMZ resistance could offer promising new molecular targets for GBM treatment. Exosomes are the most clearly defined vesicles known so far, with diameters ranging from 40 nm to 100 nm, and can be released from a variety of cell types, such as T-lymphocytes, neurons, and GBM cells . Recently, ever more attention has been paid to their potential diagnostic and therapeutic values, especially in tumors [3, 4, 5]. In general, most studies on tumor drug resistance have focused on tumor cells themselves. Genetic changes enhancing metabolic activities that inactivate drugs, oncogene activation, tumor suppressor gene inactivation, tumor heterogeneity development, and defects in apoptosis mechanisms have been found to improve drug resistance. Exosomes secreted by tumor cells serve as a key mediator of tumor communication between tumor cells or with other cells in the microenvironment. Hence, it has emerged as a new model for research into tumor resistance and become a new hotspot in the study of drug resistance in tumor biology. Long non-coding RNA (lncRNA) is a non-coding RNA longer than 200 nucleotides in length. Studies have shown that long non-coding RNAs are abnormally expressed in cancer cells and are related to cancer progression  including apoptosis , metabolism , proliferation and metastasis . Salmena and colleagues firstly propounded lncRNAs can act as a competitive endogenous RNA (ceRNA), which posited that lncRNAs derepress the level of miRNA-targeted mRNAs via sponge miRNAs [10, 11]. Based on this hypothesis, the “lncRNA-miRNA-mRNA” axes have been explored in multiple cancers including GBM ; however, the effect of ceRNA network in GBM progression especially on drug resistance is still unclear. In this study, we sought to investigate the effects of exosome-transmitted lncRNA SBF2-AS1 on the molecular mechanism underlying TMZ resistance in GBM. The finding of this study may serve to develop a potential therapy for TMZ-resistant GBM. See Additional file 1: Supplementary materials and methods for details on patient samples information. The study was approved by the Ethics Committee of Nanjing Medical University and written informed consent was obtained from all patients. Five human GBM cell lines (U87, LN229, A172, T98, U251) and human embryonic kidney (HEK) 293 T cells were purchased from the Chinese Academy of Sciences Cell Bank (Shanghai, China), N3 primary culture cell were donated from Tian Tan Hospital and four drug-related cell lines (Pri GBM, N3S, Rec GBM, N3T3rd) were used from our previous study . All GBM cells were maintained in high glucose DMEM medium supplemented with antibiotics (100 units/mL penicillin and 100 mg/mL streptomycin) and 10% fetal bovine serum (FBS). Normal human astrocytes (NHAs) were acquired from Sciencell Research Laboratories (Carlsbad, CA, USA) and cultured in astrocyte medium (Carlsbad, CA, USA). All cells were grown at 37 °C with 5% CO2. Exosomes were extracted from GBM cell culture through standard centrifugation steps as previously described . See Additional file 1: Supplementary materials and methods for details on exosome isolation. See Additional file 1: Supplementary materials and methods. Western blot analysis was done as described previously . Antibodies against caspase-3, ZEB1 (Cell Signaling Technology, USA); CD63, CD81, GM130, XRCC4 and γ-H2AX (Abcam, USA); and β-actin, GAPDH and tubulin (Santa Cruz, USA) were used for Western blot analysis. See Additional file 1: Supplementary materials and methods for details on transfection and stable cell establishment. Fish analysis was performed on human tissue and GBM cells using the method described previously . IHC was performed on mice xenogeneic tumor tissue and human tissue as described previously . The flow cytometric assay was performed as described previously . The apoptotic cells were stained with Annexin V-FITC/PI and assessed by fluorescence activated cell sorting (FACS). The colony formation assay was performed following the method described in our earlier study . Cells were independently seeded onto 6-well plates followed by treatment with TMZ (200 μM, 24 h). Then the culture media were replaced by TMZ-excluded media. After 10–15 days of growth, cells were fixed with 4% paraformaldehyde and stained with crystal violet. See Additional file 1: Supplementary materials and methods for details on immunofluorescent staining. GBM cells were fixed in 4% paraformaldehyde for 15 min and stained with In Situ Cell Death Detection Kit, POD (Roche, Switzerland) according to the manufacturer’s instructions. Tunel-positive cells were observed with a Nikon ECLIPSE E800 fluorescence microscope. RIP™ RNA-Binding Protein Immunoprecipitation Kit (Millipore, Billerica, MA, USA) was used for RIP. GBM cell lysates were prepared and incubated with RIP buffer containing magnetic beads conjugated with human anti-Argonaute2 (anti-Ago2) antibody (Millipore, Billerica, MA, USA) while normal mouse IgG (Millipore, Billerica, MA, USA) functioned as a negative control. Immunoprecipitated RNA was tested by qRT-PCR analysis to verify the presence of lncSBF2-AS1 using specific primers. See Additional file 1: Supplementary materials and methods for details on luciferase assay. Chip assay was performed using Simple Chip Enzymatic Chromatin IP kit (Cell Signaling Technology, USA) according to the manufacturer’s instructions. Briefly, the chromatin of the GBM cells were treated with 3 μg anti-ZEB1 (Abcam). Immunoprecipitated DNA was subjected to RT-PCR using specific primers. Comet assay was performed as described preciously . Briefly, GBM cells that received TMZ treatment (200 μM) were analyzed by DNA Damage Detection Kit (KeyGEN BioTECH, China). Agarose-embedded cells were lysed and examined by agarose gel electrophoresis. See Additional file 1: Supplementary materials and methods for details on Subcutaneous and orthotopic xenograft studies. All animal experiments were approved by the Institutional Committee for Animal Research of Nanjing Medical University and conducted in conformation with the Animal Welfare Act. All statistical analyses were done using GraphPad Prism 5 Software (La Jolla, CA, USA). All values were shown as mean ± Standard Error of Mean (SEM) of three independent experiments. Student’s t-test or ANOVA was performed to evaluate pairwise comparison or multivariate analysis. All statistical analyses were performed using SPSS statistics 22 software. P value < 0.05 was judged to be statistically significant. Our previous experimental results, have demonstrated that miR-151a-3p promotes TMZ sensitivity in GBM cells . Recent studies have shown that lncRNAs can act as sponges or function as competing endogenous RNA (ceRNA) to regulate miRNA expression [19, 20]. Thus, we considered whether miR-151a-3p is regulated by lncRNA. We used the bioinformatic website (DIANA TOOLS, http://diana.imis.athena-innovation.gr/) to find potential lncRNAs that could regulate miR-151a-3p. We chose the top 10 lncRNAs predicted in the website and verified their expression levels in N3 GBM cells by qRT-PCR (Additional file 2 Figure S1A). The result showed that five lncRNAs (RP11-111F5.4, PSMD-AS1, RP11-967 K21.1, SBF2-AS1, ARHGEF26-AS1) had higher expression in N3 GBM cells. We then used the dual luciferase reporter assays to verify the prediction analysis. HEK293T cells were transfected with luciferase plasmid containing the sequence of miR-151a-3p together with plasmids carrying the lncRNAs or control sequence. We found that lncSBF2-AS1 had the strongest ability to suppress miR-151a-3p-driven luciferase activity (Additional file 2 Figure S1B). Meanwhile, Knockdown of SBF2-AS1 in N3 GBM cells had the highest caspase-3 activity (Additional file 2 Figure S1C). Then we examined the levels of SBF2-AS1 in normal human astrocytes (NHA) and five GBM cell lines (U87, LN229, A172, T98, U251) using qRT-PCR. All GBM cells were found to highly express SBF2-AS1 in comparison with NHAs (Additional file 2 Figure S1D). Next, we analyzed lncSBF2-AS1 in TCGA database of GBM and found that lncSBF2-AS1 level was higher in GBM than low-grade gliomas (LGG), and high SBF2-AS1 expression correlated with poor survival in GBM patients (Additional file 2 Figure S1E and F). Thus, we considered lncSBF2-AS1 as the upstream of miR-151a-3p and lncSBF2-AS1 was chosen as a candidate for further investigation. To confirmed the effect of SBF2-AS1 on chemoresistance, we first analyzed TMZ-resistance and TMZ-sensitive GBM cell viability in response to TMZ (Fig. 1a and b). The levels of SBF-AS1 in TMZ-sensitive cell lines and TMZ-resistant cell lines, analyzed by qRT-PCR, showed that TMZ resistant cells had higher SBF2-AS1 levels (Fig. 1c). Then we measured SBF2-AS1 levels in 20 primary GBMs and 20 recurrent GBMs by qRT-PCR (Fig. 1d). Fluorescence in situ hybridization (FISH) assays employing SBF2-AS1 probe showed that recurrent GBM tissues displayed higher level of SBF2-AS1, whereas primary GBM tissues exhibited lower SBF2-AS1 signal (Fig. 1e). Together, these results suggest that lncSBF2-AS1 is upregulated in TMZ-resistant GBM cell lines and tissues, pointing towards a possible correlation between SBF2-AS1 and TMZ resistance. To determine whether lncSBF2-AS1 is associated with TMZ resistance, we overexpressed SBF2-AS1 in N3S and Pri GBM cells (TMZ sensitive cell line, Fig. 1a and b and Fig. 2a). We found that Pri GBM and N3T3rd cells transfected with vector control (VC) showed a significant decrease in colony-forming ability after TMZ treatment, whereas overexpression of SBF2-AS1 in Pri GBM and N3S cells rescued the colony-forming capacity of TMZ (Fig. 2b). We also tested apoptotic rate of TMZ-sensitive cells overexpressing SBF2-AS1 or VC cells in response to TMZ. As shown in Fig. 2c, d and e, a marked decrease in number of apoptotic cells with a co-dependent reduction in apoptosis related protein, cleaved caspase-3 , was observed in N3S and Pri GBM cells overexpressing SBF2-AS1 compared with VC cells. These findings indicate that SBF2-AS1 overexpression reverses TMZ-induced apoptosis and growth inhibition in TMZ sensitive GBM cells. To examine whether lncSBF2-AS1 confers TMZ resistance in vivo, Pri GBM cells expressing SBF2-AS1 or VC was subcutaneously injected into immunocompromised mice. After GBM engraftment was confirmed, we treated mice with TMZ (66 mg/kg/day, 5 days per week for three cycles) or DMSO. We observed that mice injected with Pri GBM-VC had a marked decrease in tumor volume and weight in response to TMZ treatment, whereas xenografts overexpressing SBF2-AS1 had unconspicuous effects on tumor growth when treated with TMZ (Fig. 2f, g and h). IHC staining was performed to verify the expression of cleaved caspase-3. TMZ treated xenografts overexpressing SBF2-AS1 had a significantly decreased level of cleaved caspase-3 compared with control xenografts (Fig. 2i). Hence, our data indicated that overexpression of SBF2-AS1 can lead to the development of acquired TMZ resistance. According to the above findings, we determined whether depletion of SBF2-AS1 could cause sensitization to TMZ in GBM cells. We transfected TMZ-refractory recurrent GBM cells and N3T3rd cells (TMZ resistant cell line, Fig. 1a and b) with three separate luciferase-encoding SBF2-AS1 shRNA or control shRNA. The expression of SBF2-AS1 in recurrent GBM cells and N3T3rd cells was analyzed by qRT-PCR (Fig. 3a). According to the knockdown efficiency, we chose shSBF2-AS1–2 for subsequent experiments. SBF2-AS1-knockdown recurrent GBM cells and N3T3rd cells showed a significant decrease in colony-forming ability (Fig. 3b) and the delay in apoptosis was remarkably increased (Fig. 3c, d and e). Then we investigated the role of SBF2-AS1 deletion on TMZ resistance in vivo. SBF2-AS1-depleted Rec GBM cells or control cells were inoculated subcutaneously into immunocompromised mice. The tumor-bearing mice were given DMSO or TMZ treatment (66 mg/kg/day). As we expected, the growth ability of tumor generated by shSBF2-AS1-expressing GBM cells were significantly lower than those produced by control GBM cells after exposure to TMZ (Fig. 3f, g and h). We also used IHC to measure cleaved caspase-3. SBF2-AS1-knockdown xenografts had an obviously high expression level of cleaved caspase-3 in comparison with control xenografts in response to TMZ (Fig. 3i). 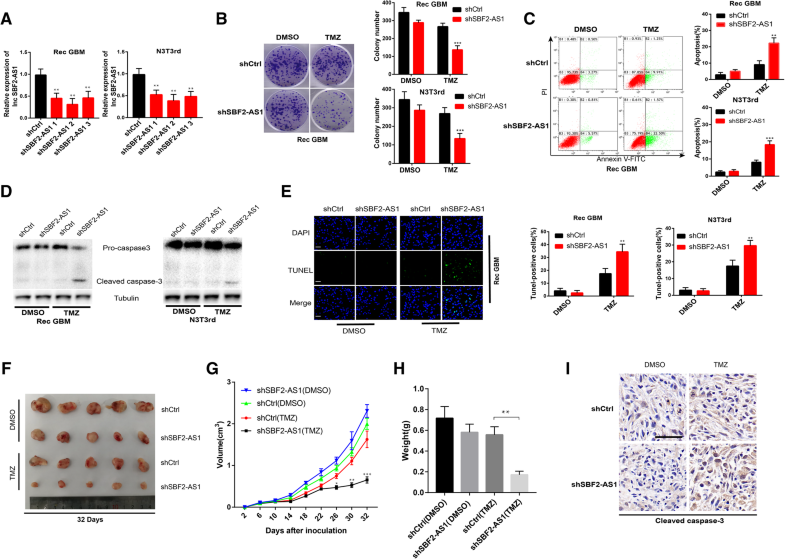 These results confirm that inhibition of lncSBF2-AS1 endows TMZ-refractory recurrent GBM cells with chemotherapy sensitivity in vitro and in vivo. Several studies have shown that transcription factors can bind to specific regions of promoters to regulate gene expression . Therefore, we explored if transcription factors can regulate SBF2-AS1. Potential transcription factors were predicted using the JASPAR database (http://jaspar.binf.ku.dk/), and luciferase reporter assays were performed to determine the most interactive transcription factor from the top five predictions. Briefly, HEK293T cells were transfected with luciferase plasmid containing the sequence of the SBF2-AS1 promoter region together with plasmids containing the transcription factors or control sequence. The results showed that ZEB1 revealed maximum luciferase activity (Additional file 3 Figure S2A). Then we analyzed ZEB1 expression in TMZ-resistance cells and TMZ-sensitive cells (Additional file 3 Figure S2B). Based on luciferase activities and ZEB1 protein levels in GBM cells, we chose ZEB1 as the object for further study. ZEB1(Zinc finger E-box binding homeobox 1), the key factor of EMT (Epithelial-mesenchymal transition), have been reported as a important molecule for GBM chemoresistance and recurrence . We selected 20 recurrent GBM tissues and correlation analysis between ZEB1 and SBF2-AS1 indicated that the expression level of SBF2-AS1 is correlated with that of ZEB1 (Fig. 4a). To further confirm our hypothesis, we knocked down or overexpressed ZEB1 in Rec GBM or Pri GBM cells, respectively (Fig. 4b), and detected SBF2-AS1 level by qRT-PCR (Fig. 4c). The results showed that SBF2-AS1 level was positively correlated with ZEB1 level. By scanning the promoter region of SBF2-AS1 with the JASPER database, we found four putative ZEB1 binding sites (Fig. 4d). Chromatin immunoprecipitation assay (CHIP) was performed to elucidate the binding of ZEB1 and SBF2-AS1 promoter region. We observed PCR products in the ZEB1 immunoprecipitation in the Site 2 group, which confirmed that ZEB1 bound to SBF2-AS1 promoter at the − 684 to − 676 bp region (Fig. 4e). These data indicated that transcription factor ZEB1 could regulate SBF2-AS1 at transcription level. In addition, we checked the relationship between ZEB1 and SBF2-AS1 in vitro. The apoptosis of cells was significantly decreased in ZEB1-overexpressed Pri GBM cells as opposed to ZEB1-knockdown Rec GBM cells (Fig. 4f, g and h). These findings indicated that ZEB1 could regulate the level of SBF2-AS1 and was involved in SBF2-AS1-mediated apoptosis of GBM cells. As mentioned above, there might be a connection between SBF2-AS1 and miR-151a-3p. Increasing evidence shows that lncRNAs can function as ceRNAs for miRNAs or interact with RNA-binding proteins to regulate target gene expression [24, 25]. To further evaluate the molecular mechanism by which SBF2-AS1 promotes TMZ resistance in GBM cells, we firstly used FISH and subcellular fractionation to analyze its distribution. The results showed that SBF2-AS1 was primarily observed in the cytoplasm (Fig. 5a and Additional file 4 Figure S3A), indicating that SBF2-AS1 might function as a ceRNA to regulate target expression. To confirm that miR-151a-3p binds directly to SBF2-AS1, we set up a dual luciferase reporter assay. The observed miR-151a-3p-mediated suppression of luciferase activity was inhibited by mutation (MUT) of SBF2-AS1 (Fig. 5b). Moreover, RNA-binding protein immunoprecipitation (RIP) assay showed that in control GBM cells, the amount of lncSBF2-AS1 and miR-151a-3p immunoprecipitated with Ago2 was higher than respective IgG group, and knockdown of miR-151a-3p restrained the enrichment of SBF2-AS1 and miR-151a-3p in Ago2 precipitates (Fig. 5c and d). Then, we analyzed the correlation between lncSBF2-AS1 and miR-151a-3p levels in 20 pairs of recurrent GBM cancer tissues by using qRT-PCR. The result showed an inverse correlation between lncSBF2-AS1 and miR-151a-3p levels (Additional file 4 Figure S3B). Collectively, these data demonstrate that SBF2-AS1 sponges miR-151a-3p by acting as a ceRNA. To investigate whether miR-151a-3p participated in SBF2-AS1-mediated apoptosis of GBM cells, miR-151a-3p was knocked down or overexpressed in SBF2-AS1-depleted GBM cells. Then the apoptosis of GBM cells in response to TMZ was determined. The results showed that overexpression of miR-151a-3p promoted the suppressive effect on TMZ resistance, which was induced by SBF2-AS1 knockdown in GBM cells, while inhibition of miR-151a-3p reversed the SBF2-AS1 knockdown-mediated apoptosis in GBM cells in response to TMZ (Fig. 5e and f). Together, these results showed an involvement of miR-151a-3p in lncSBF2-AS1-mediated TMZ resistance in GBM cells. As lncSBF2-AS1 can sponge miR-151a-3p and XRCC4 is a miR-151a-3p target gene , we determined whether lncSBF2-AS1 can regulate the expression of XRCC4 by sponging miR-151a-3p. We found knockdown of lncSBF2-AS1 also reduced XRCC4 protein levels in N3T3rd and recurrent GBM cells (Fig. 6a). To determine whether miR-151a-3p plays an important role between lncSBF2-AS1 and XRCC4, we co-transfected miR-151a-3p inhibitor and shSBF2-AS1 into recurrent GBM cells. Indeed, the suppression of XRCC4 protein levels induced by shSBF2-AS1 was effectively reversed by the miR-151a-3p inhibitor (Fig. 6b). Then, we analyzed the correlation between lncSBF2-AS1 and XRCC4 expression in 20 recurrent GBM cancer tissues. The result showed a positive correlation between lncSBF2-AS1 and XRCC4 expression, consistent with the existence of an lncSBF2-AS1-miR-151a-3p-XRCC4 regulatory axis (Fig. 6c). 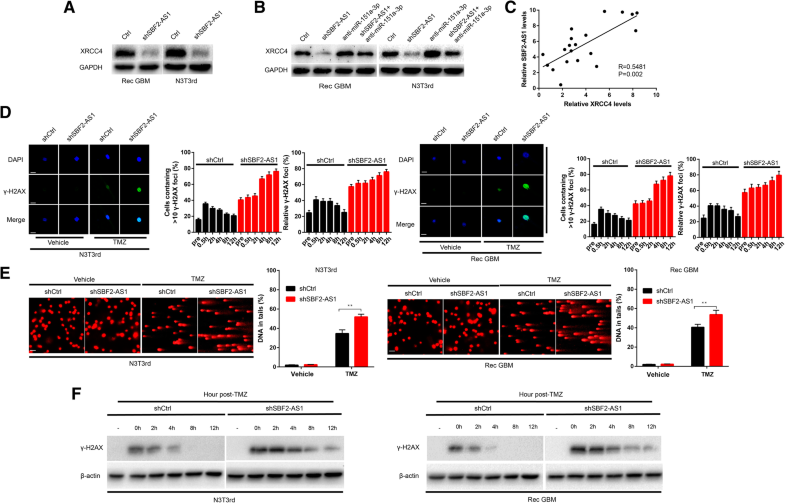 Together, these data suggested that lncSBF2-AS1 regulates the expression of XRCC4 by post-transcriptional modulation of miR-151a-3p. Recent studies have reported that TMZ resistance can be promoted by DNA double-strand break (DSB) repair [26, 27, 28] and lncRNAs play an essential role in DSB [29, 30]. Thus, we wondered whether improved DSB repair is directly dependent on lncSBF2-AS1. A sensitive marker of DSBs, γ-H2AX , was assessed by confocal microscopy. We found that although the average number of γ-H2AX focis were slightly different in control shRNA (shctrl) and shSBF2-AS1 groups, the number of γ-H2AX focis in shSBF2-AS1 cells showed a significant increase within 8 h after TMZ removal, whereas shctrl cells had a constantly low number of γ-H2AX (Fig. 6d), even at 12 h. We next employed comet assay to survey DNA repair progression. The tail was still detectable in SBF2-AS1-depleted GBM cells 12 h after TMZ withdrawal. Meanwhile, the process of DSB clearance was completed within 12-h after TMZ removal in control cells (Fig. 6e). Furthermore, using Western blot assay, we found persistence of high expression level of γ-H2AX in GBM cells lacking SBF2-AS1, but not control cells 12 h after the end of TMZ treatment (Fig. 6f). These data showed that depletion of lncSBF2-AS1 delayed the repair process of TMZ-induced DNA damage. Cell-secreted exosomes and their contents can be internalized by surrounding cells [32, 33]. Nucleotide is one of the inclusions of exosomes  and lncRNAs transferred by exosomes promote drug resistance [35, 36]. To investigate the manner of SBF2-AS1 intercellular delivery, the level of SBF2-AS1 was analyzed by qRT-PCR. We found that the level of SBF2-AS1 in the culture medium showed only a slight change upon RNase treatment but markedly decreased after treated with RNase and Triton X-100 synchronously (Fig. 7a), indicating that extracellular SBF2-AS1 was mainly packed in membranes. Then we isolated exosomes derived from TMZ-resistant glioma cells and parental cells. The characteristics were analyzed, and quantification was done using transmission electron microscopy (TEM), nanoparticle tracking analysis (NTA) and Western blot analysis. A typical lipid bilayer membrane was observed, and the size of exosomes were confirmed by TEM and NTA (Fig. 7b and c). A Western blot analysis showed the proteins CD63 and CD81 were positively expressed in exosomes and GM130 was mainly present in the cell lysate  (Fig. 7d). Next, we determined whether the exosomes of TMZ-resistant cells (Rec GBM and N3T3rd cells) transferred SBF2-AS1 to parental cells (Pri GBM and N3S cells). Rec GBM and N3T3rd cells were co-transfected with fluorescein amidite (FAM)-tagged SBF2-AS1 and exosomal marker CD63. The exosomes were isolated from culture medium collected from Rec GBM and N3T3rd cells. Parental cells were treated with purified exosomes. SBF2-AS1 wrapped by exosomes and internalization of exosomes were observed by confocal microscopy (Fig. 7e). To further confirm the effect of exosomal lncSBF2-AS1, we knocked down SBF2-AS1 in TMZ-resistant cells and the level of lncSBF2-AS1 in exosomes echoed (Additional file 5 Figure S4A). Then the exosomes were used to treat parental cells and we found that the apoptosis of parental cells, treated with Rec GBM and N3T3rd exosomes showed a significant decrease after TMZ treatment, however, knockdown of exosomal SBF2-AS1 reversed the apoptosis of GBM cells (Fig. 7f, g and h). Meanwhile, the lncSBF2-AS1 transfer of TMZ-resistant exosomes downregulated XRCC4 expression in Pri GBM and N3S cells (Additional file 5 Figure S4B), and exosomal lncSBF2-AS1 accelerated the DNA damage repair in GBM recipient cells after TMZ treatment (Additional file 5 Figure S4C and D). Thus, our data indicated that exosomal lncSBF2-AS1 could enhance chemoresistance to TMZ in vitro. 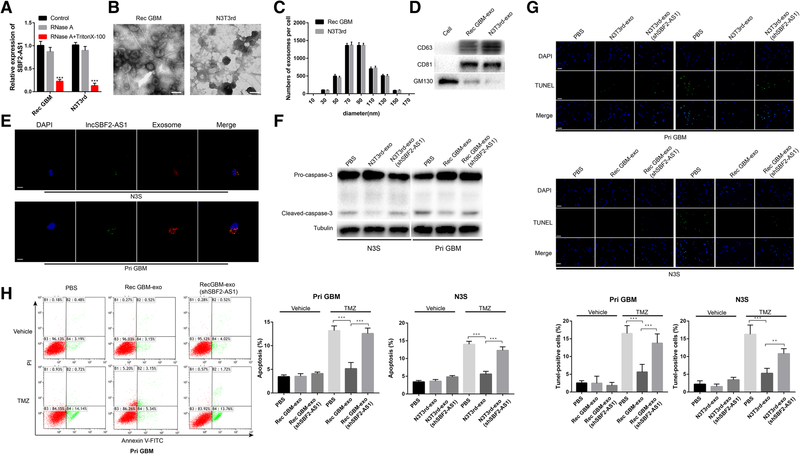 To investigate whether exosomal lncSBF2-AS1 is necessary for TMZ resistance in vivo, mice were orthotopically injected with 2.5 × 105 luciferase-labeled Pri GBM cells following pre-incubation with PBS, Rec GBM-exo or Rec GBM-exo (shSBF2-AS1) for 2 days. The tumor-bearing mice were exposed to DMSO or TMZ (66 mg/kg/day) for 5 days each week for three cycles and analyzed by bioluminescence imaging. Control xenografts showed tumor progression. We found that xenografts carrying Rec exosomes treated Pri GBM cells displayed a significant advance of tumor growth in response to TMZ. Meanwhile, SBF2-AS1-depleted Rec exosomes treated Pri GBM cells demonstrated a regression in tumor progression after TMZ treatment (Fig. 8a). The findings were also confirmed by the survival curves (Fig. 8b), bioluminescence assay (Fig. 8c) and TUNEL staining (Fig. 8d). Moreover, we performed FISH and IHC on xenograft tissues receiving TMZ therapy. Tumors with high SBF2-AS1 levels (Rec-exo treated) tended to express lower miR-151a-3p and lower protein levels of cleaved caspase-3 and γ-H2AX and higher protein level of XRCC4 (Fig. 8e). Higher protein levels of cleaved caspase-3 and γ-H2AX and higher miR-151a-3p level together with lower XRCC4 level was observed in low SBF2-AS1 groups (PBS treated and Rec GBM-exo (shSBF2-AS1) treated) (Fig. 8e). These data indicate that exosomal lncSBF2-AS1 promoted development of acquired resistance to TMZ in vivo. Exosomal RNAs can be transferred to neighboring cells or cells in other organs through the circulation system . Furthermore, exosomal lncRNA has been considered as a potential biomarker of tumor chemoresistance . Thus, exosomal lncSBF2-AS1 secreted by recurrent GBM cells may be detected in circulation. To confirm our assumption, we extracted serum exosomes collected from recurrent GBM patients and compared them with primary GBM patients (patient information are listed in Additional file 6: Table S3). Purified exosomes were authenticated by TEM analysis and Western blotting analysis (Fig. 9a and b). qRT-PCR assay was performed, and we found that exosomal lncSBF2-AS1 was enriched in the serum of recurrent GBM patients instead of primary GBM patients (Fig. 9c). Recurrent GBM patients with higher serum exosomal SBF2-AS1 levels had worse prognosis, forecasting a poor response to TMZ treatment (Fig. 9d). IHC staining was performed to evaluate the correlation between exosomal lncSBF2-AS1 and apoptosis marker cleaved caspase-3 in recurrent GBM patients. The results showed that exosomal lncSBF2-AS1 levels in the serum of recurrent GBM patients were positively correlated with cleaved caspase-3 expression (Fig. 9e). Altogether, our data indicates that exosomal lncSBF2-AS1 may serve as a promising diagnostic biomarker for recurrent GBM patients. The therapeutic options for glioblastoma multiforme patients are limited by TMZ resistance. Thus, it is necessary to investigate the biological basis of TMZ resistance and identify novel targets for the prevention and therapy of resistance to TMZ. Growing evidence has emphasized the association of lncRNAs with tumor chemoresistance and the possibility that lncRNAs function as biomarkers [39, 40, 41]. Aberrantly expressed lncRNAs are crucial regulatory factors in GBM [42, 43, 44]. To identify the potential biomarkers for TMZ treatment, we focused on exosomal lncRNAs, and investigated the functional correlation between TMZ resistance and specific lncRNAs in GBM. In the present study, we identified an uncharacterized lncRNA, lncSBF2-AS1, which may function as an oncogene in GBM by promoting cell TMZ-resistance, and inhibition of lncSBF2-AS1 might serve as a promising clinical therapeutic approach in GBM treatment. Meanwhile, lncSBF2-AS1 may function as a hopeful biomarker for reaction to chemotherapy. LncRNAs have been further reported as playing critical roles in cancer progression [45, 46] especially chemoresistance . Combined with our previous report , we identified lncRNA SBF2-AS1 as a potential lncRNA, which is necessary for enhancing TMZ resistance. LncRNA SFB2-AS1 (ENSG00000246273) has been rarely reported. It was first described as an oncogene in non-small cell lung cancer  and has been recently reported as a key molecule in GBM angiogenesis . Herein, we reported a novel function of SBF2-AS1 in TMZ resistance. SBF2-AS1 is activated by the transcription factor ZEB1 and we detected that SBF2-AS1 was upregulated in GBM cells and tissues derived from recurrent GBM patients who were resistant to TMZ treatment. Moreover, ectopic expression of SBF2-AS1 in parental GBM cells facilitated acquirement of TMZ resistance, however, depletion of SBF2-AS1, sensitized TMZ-refractory GBM cells to TMZ in vitro and in vivo. These results were further supported by the detection that xenografts expressing low levels of SBF2-AS1 exhibited markedly better survival after TMZ treatment compared with xenografts expressing high levels of SBF2-AS1. Thus, our data shed insight on the importance of SBF2-AS1 as a potential prognostic and predictive marker of response to TMZ. To futher understand the role of lncSBF2-AS1 in GBM, we localized its expression in GBM cells and found that lncSBF2-AS1 mainly expressed in the cytoplasm, which indicates lncSBF2-AS1 may function as miRNA sponges. Competing endogenous RNA (ceRNA), a novel and widespread interaction network, where lncRNAs could regulate miRNA through binding and titrating them off their binding sites on protein coding messengers [19, 49]. For example, LncRNA FER1L4 functions as a ceRNA to modulate PTEN expression through regulation of miR-106a-5p in gastric cancer . LncRNA CASC2 acts as a sponge for miR-21 to sensitize cervical cancer to cisplatin . LncRNA KCNQ1OT1 regulates cisplatin resistance by acting as a ceRNA to modulate the expression of miR-211-5p in tongue cancer . Combined with our previous results and bioinformatic analyses, we used RIP analysis and luciferase reporter assays to verify if miR-151a-3p acts as a direct target for both SBF2-AS1 and XRCC4 genes and is responsible for SBF2-AS1-mediated TMZ resistance. Our findings discovered the significance of the interaction between SBF2-AS1 and miR-151a-3p in GBM TMZ resistance and that SBF2-AS1 acts an oncogene partly by sponging miR-151a-3p in GBM cells. Acceleration of DNA DSB repair can enhance TMZ chemoresistance in GBM cells, and increase the survival of GBM cells under TMZ treatment [26, 53], resulting in tumor recurrence. XRCC4, a major factor for DSB repair, has recently been verified to be associated with TMZ resistance [54, 55, 56]. Our previous study has reported miR-151a-3p can regulate TMZ resistance in GBM cells by targeting XRCC4. However, function as the upstream of miR-151a-3p, the effect of lncSBF2-AS1 on DNA damage repair is still unclear.. In the present study, we tried to collect direct evidence to demonstrate that depletion of SBF2-AS1 markedly reduced XRCC4 levels, retarded the process of DSB repair, and induced cells to become sensitive to TMZ. Zinc finger E-box binding homeobox 1 (ZEB1) is the key factor of Epithelial-mesenchymal transition (EMT) and cancer cells undergoing EMT show more chemoresistance [23, 57, 58]. In recent study, ZEB1 can regulate therapy resistance in lung adenocarcinoma , hepatocarcinoma  and ovarian cancer . In the present study, we found ZEB1 can binding the promoter region of lncSBF2-AS1 and regulate the expression level of lncSBF2-AS1. Meanwhile, overexpression or depletion of ZEB1 represented the changes of TMZ-resistance in GBM. Above all, our data found the regulatory mechanism of lncSBF2-AS1 and indicated the important role of ZEB1 on chemoresistance of GBM. A growing number of evidences suggest exosomes can protect lncRNAs from degradation in the circulation and exosomal lncRNAs could be used to monitor cancer at an early stage [62, 63]. Exosomes are nano-sized vesicles that exhibit vesicular–like characteristics and fuse with plasma membranes of various cell types . Increasing reports have shown the unique characteristics of exosomes, including their ability to package specific lncRNAs, circRNAs and miRNAs with stability and easy detection in the circulatory system . They have been confirmed as intercellular messengers that transfer cellular components, including lncRNAs . In our study, we found that lncSBF2-AS1 can be enclosed into exosomes. Parental GBM cells treated with TMZ-resistant exosomes exhibited a resistant phenotype. Meanwhile, knockdown of exosomal lncSBF2-AS1 can partially reverse chemoresistance of parental cells. In addition, the in vivo experiments also demonstrated exosomal lncSBF2-AS1 can spread TMZ resistance. Based on the functional observations, exosomal SBF2-AS1 level was determined in clinical serum samples. Repeated attempts have been made to use lncRNAs in circulation as biomarkers . Nevertheless, these potential predictors are always in relatively low abundance and easily degradable. LncRNAs are enriched and steady in the circulatory exosome system. Thus, the levels of exosomal lncRNAs can help in the prognosis of several cancers, and thus, can be used as cancer biomarkers [35, 39]. Our result showing that SBF2-AS1 levels in the serum of recurrent GBM patients who were under TMZ treatment were higher as compared to normal subjects. These data provide novel evidence that circulating exosomal SBF2-AS1 may serve as a potential predictor for TMZ-resistant GBMs. Collectively, our study demonstrated that exosome-mediated transfer of lncRNA SBF2-AS1 spreads TMZ resistance in GBM cells. Exosomal SBF2-AS1 levels in human serum may function as a potential diagnostic biomarker in GBM patients, optimizing the clinical benefits of TMZ therapy and have important significance in the development of treatment strategies for TMZ-resistant GBM patients. This work was supported by National Nature Science Foundation of China (No. 81402056 and 81472362) and National Key Reserch and Development Plan (No. 2016YFC0902500). All data generated or analyzed during this study are included either in this article or in the additional files. ZZ mainly did the expriment and wrote the paper, C. Lu and YW helped do the cell experiment and review the manuscript, JY and AZ helped do analysis and interpretation of data. YY mainly constructed the idea of this article and provided administrative, technical and material support. All authors read and approved the final manuscript. The study was approved by the Ethics Committee of Nanjing Medical University and written informed consent was obtained from all patients. We have obtained consents to publish this paper from all the participants.